Tiong Bahru is a fascinating area built in the 1930s and 40s so the low rise housing is firstly unique in being low rise and secondly distinctly art deco in style. Only a few minutes walk from home I first visited to shop at the wet market for fish, meat and vegetables which though a much newer building is built in keeping with the area. Around the area many of the ground floor places have become shops and many of those have in recent years been transformed into trendy cafes, bakeries and other eateries. There are also bookshops and upmarket quirky lifestyle stores. All of this gentrification is apparently forcing up rents and forcing out older tenants and has led to headlines wondering if the residents of Tiong Bahru might soon be drowning in cappuccinos. It certainly has made the top ten list of the hippest places in the world including a nomination by Vogue magazine as number 4 in its top 15 coolest places to live! 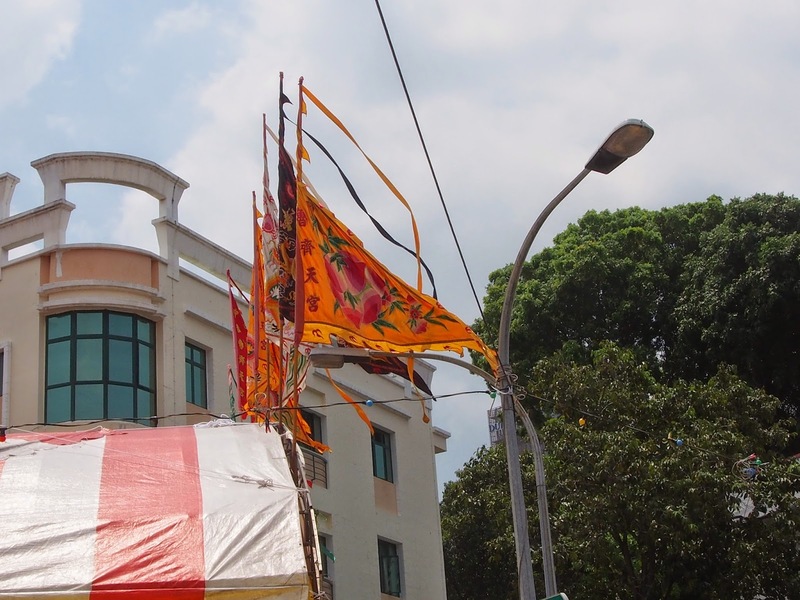 However behind the main streets lie quiet footpaths and gardens – above all Tiong Bahru remains a residential estate of families and generations of families. There is even a huge bomb shelter should either Indonesia or Malaysia threaten the island again. 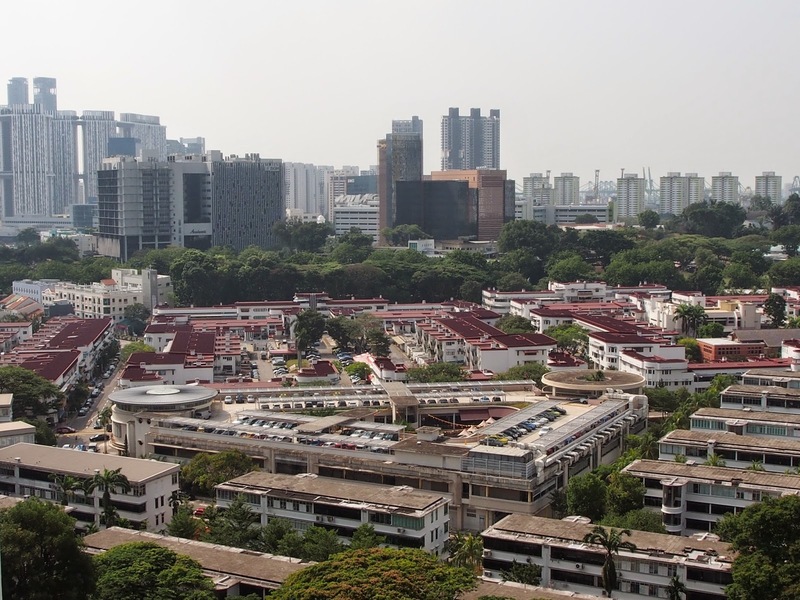 Our tour took us to the 21st floor of one of the nearby HDB blocks (the Housing Development Board is responsible for social housing across Singapore) for views across Tiong Bahru to Singapore General Hospital. Originally the area was housing for staff from the hospital and for “third wives” aka the women who worked in the cabaret bars of the Great World Amusement Park just up the road. The latter is now a shopping mall and today’s nurses probably can’t afford Tiong Bahru rents! Another sign of the times is Birdsong Corner – once the elderly men hung up their bird cages and sat and drank their coffee by the nurses home, judging whose bird had the best song or looked the prettiest etc. When the nurses home was redeveloped into a hotel new bird cage hooks located in a central area of the HDB housing far from the coffee shops and in deep shade. Sadly if the planners had asked the locals first they would have realised it would not be suitable so now stands rather forlorn. The original bird cage corner now has ornamental hooks but being by a busy mainroad and without a coffee shop or seating serves only as a place for tourists to stand and take photos. What of the monkey god? As far as I can tell he was a character in a 16th century novel which in turn was based on folk stories. 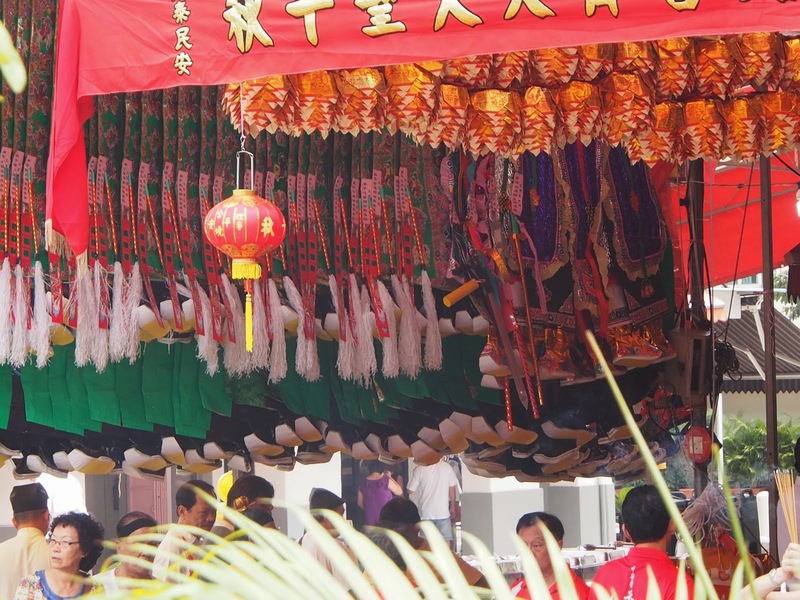 Born from a stone Sun Wu Kong was a fierce character, a sort of demon, who was tricked into wearing a band around his head that tightens when a special chant is made causing the god great pain and hence controlling him. 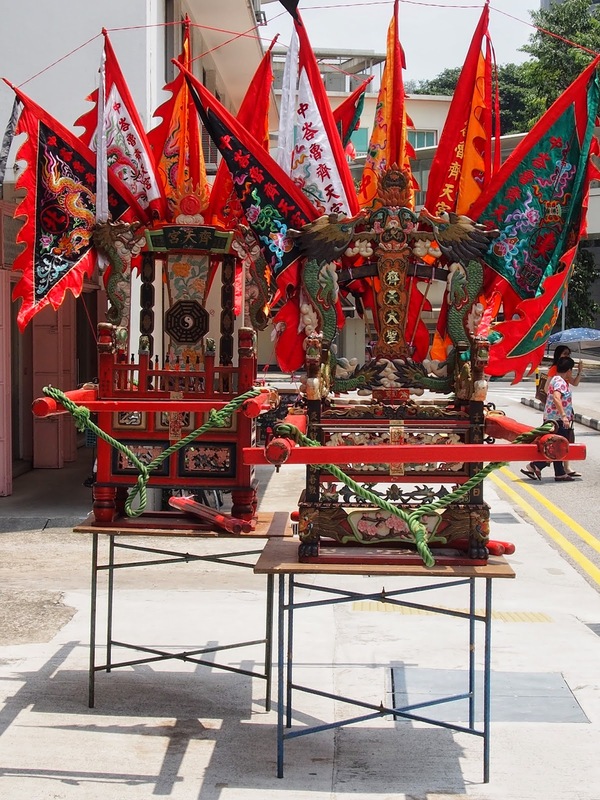 Today Taoists believe he helps them in their business lives and he has been worshipped in Singapore since the 1920’s. 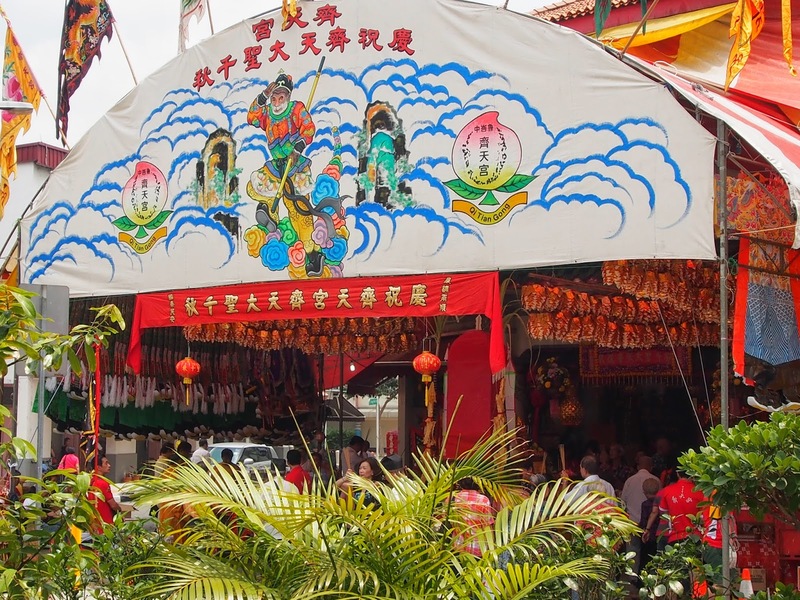 On the occasion of his birthday there is lion dancing and an afternoon parade around the streets of Tiong Bahru and later a performance of Chinese Opera on the street corner opposite the Monkey God Temple.